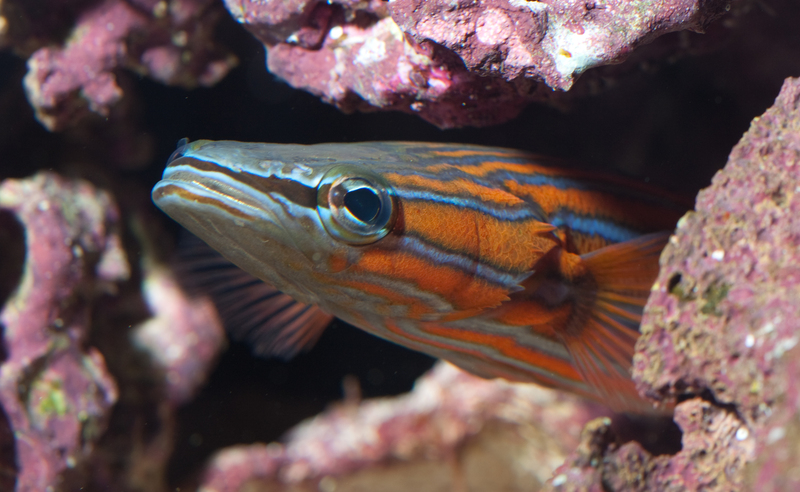 By Todd Gardner The transition from full-time aquarist, to full-time professor has been quite an adjustment for me. I love teaching very much, and I am lucky to be at a school where I have so much freedom in my lab, however my lab is limited to a single room that doubles as a classroom for multiple courses. As I’ve moved in and expanded the few sparsely-populated tanks with circa-1974 filtration, into three walls of aquaria and culture tanks, two things have become painfully clear: 1) I don’t have time to take care of all these tanks, and 2) My entire marine science budget for the year doesn’t even cover the salt I need to do water changes on them. The first year was rough. I came in seven days a week to make sure the fish were fed and I spent my entire budget on salt. The problem was that all of this time and money were being spent just to keep fish alive. The idea of getting back into serious breeding seemed impossible. I wondered if my aquaculture days were over. I chalked it up to just being one of life’s trade-offs. I had a better job and more time with my family. I would have to give up some things. 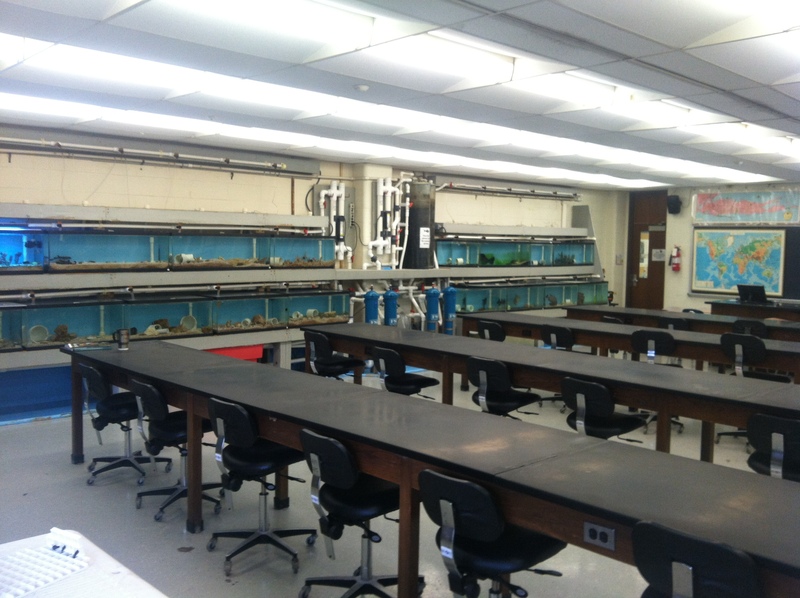 SCCC Marine Science Lab. Photo by Todd Gardner. But then something amazing happened. An outpouring of support from friends and colleagues gave me renewed hope. My wife, Ashleigh, made it clear from the start, that she would accommodate my schedule if I needed to put in more time at my lab, or better yet, help me build a fish room in our basement. Paul Anderson, the lab assistant for our science department informed me that he would gladly come in to feed fish on weekends as needed so I could take a whole day off once in a while – even though no part of his job description obligates him to do so. Bob Stark from ESV informed me that he would meet my salt needs so that my budget would be freed up for other things. Bob even goes so far as to deliver the salt in person. Larry Dupont began donating much of the food needed to support the marine life in my lab, freeing up even more of my budget. At a Manhattan Reefs Frag Swap, Randy Donowitz introduced me to Jared Goldenberg of Fluid Dynamics International, an aquarium service company. Jared had a client who was interested in acquiring some very rare fish and needed a place to keep them for a while. He was also interested in supporting my aquaculture efforts. This is how a small classroom at a small community college on eastern Long Island came to be home to one of the most valuable fish collections on the planet. Male flathead perch in broodstock tank. Photo by Todd Gardner. 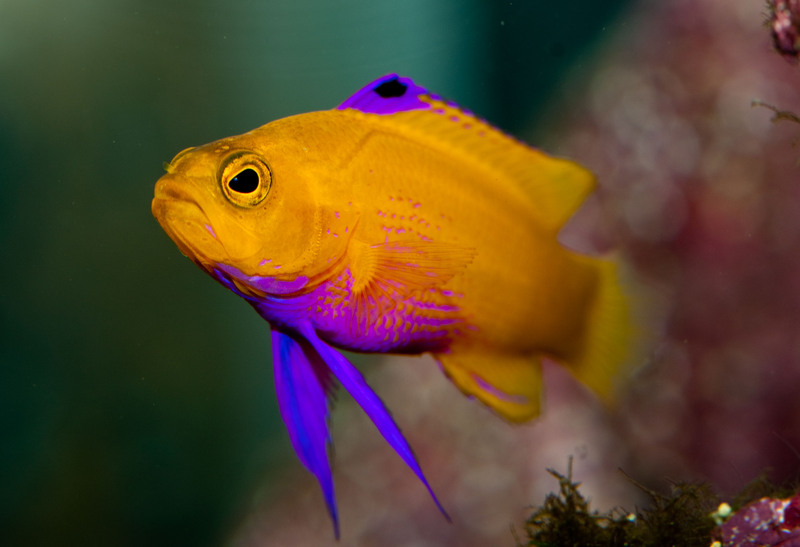 Currently, the collection consists of some of Karen Brittain’s masked angelfish (Genicanthus personatus), a pair of Interruptus angels (Centropyge interruptus), one of a very few pairs of flathead perch (Rainfordia opercularis) in captivity, and a small broodstock of reef basslets (Gramma spp. ), including the only Gramma dejongi in the US. Rounding out the room is a variety of exotic and locally-caught tropical and temperate marine life, including corals, nudibranchs, and ctenophores. Gramma dejongi. Photo by Todd Gardner. 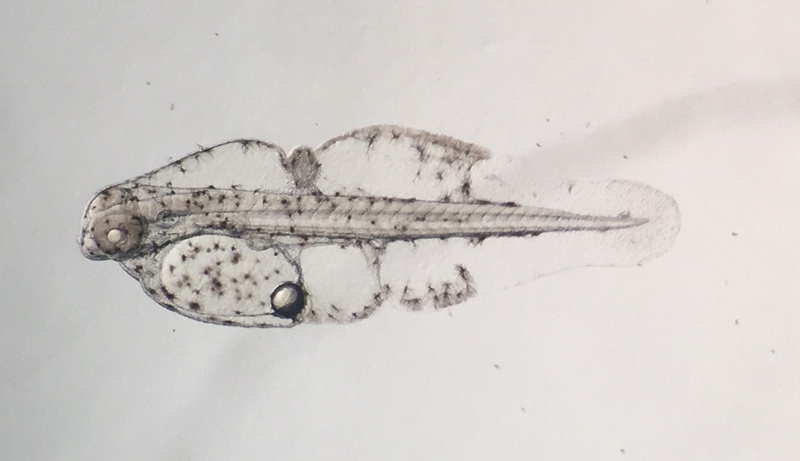 For me, the most exciting fish addition to the lab so far, has been the pair of flathead perch (If you’ve never seen one, picture a jumbo candy bass). R. opercularis is the only known species in its genus and it is closely related to the Liopropoma. Having some experience in rearing Liopropoma larvae I was eager to get my hands on Rainfordia eggs. I was also a bit intimidated however, as Liopropoma have the most difficult larvae I have worked with to date. 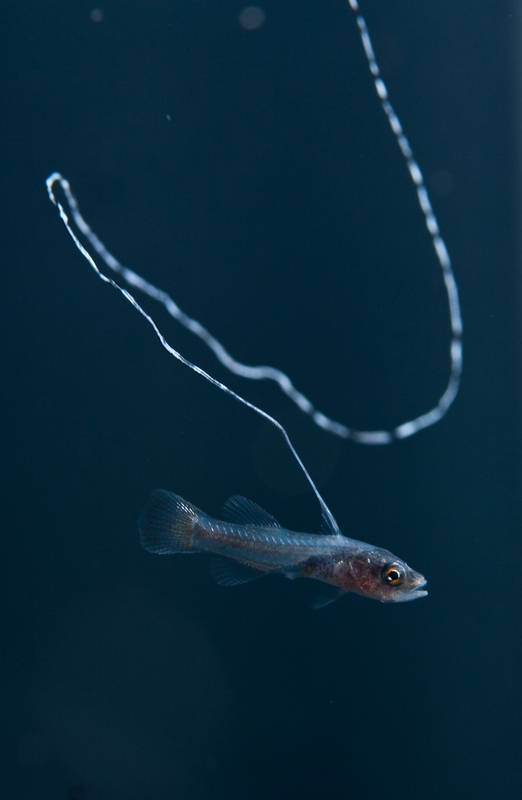 The L. carmabi that I raised at the Long Island Aquarium a few years ago had a 120 day larval period, two very long dorsal filaments that were a tangle hazard in the confines of a rearing tank, and suffered a very high mortality. Still, during that rearing attempt, I had a nearly limitless supply of natural seawater, plenty of time (most days) to fuss over my larvae, backup help for weekends, and abundant space for culturing algae and zooplankton. In my current situation, confined to one small classroom that needs to accommodate a class of 24 students multiple times each day, I felt like raising difficult larvae may be asking too much. Thankfully, before I found myself falling too deep into a pit of despair, my next hero entered the picture. I ran into Erik Stenn of Algagen at a club meeting in Connecticut. After listening to me complain for a half hour, Erik offered to support the Rainfordia project by supplying weekly deliveries of copepods and phytoplankton as soon as spawning began. This took an enormous weight off me as I was still struggling to find space and funding to get live food cultures up and running. A few months later, after the flatheads had become established in their tank (a standard 120- gallon tank with live rock), I decided to try collecting eggs. I started, as usual, by placing a piece of 500-micron nylon mesh across the overflow, hoping that water pressure alone would keep it adhered and that eggs would be large enough to get caught on the mesh. The next morning I found the mesh on the bottom of the tank. That evening, before leaving, I placed the mesh on the overflow again. This time I fastened it on with a single clothes pin. The next morning just before class, I checked the screen, only to find that the flow pattern in the tank had pushed it off of the overflow and it was only adhered at the clothes pin. After rummaging around all of the drawers in the lab, I came across some old plastic clamps that must have been for holding the tubes from some canister filter to the side of a tank. That night I used both clamps to fasten the screen on at both ends of the overflow. The next morning when I arrived I approached the tank tentatively, bracing myself for some new screen mishap, but was relieved to see it still attached, just as I had left it. I carefully removed the clamps, then slid the screen off of the overflow and was finally rewarded with about 50 glistening eggs. With trembling hands, I rinsed the eggs off of the screen, into a dish of clean salt water. Examining them under a dissecting microscope, I could immediately see that most of them were cloudy and their oil droplets were white (not a good sign), but I did see development in a couple of them, so at least they were fertilized. 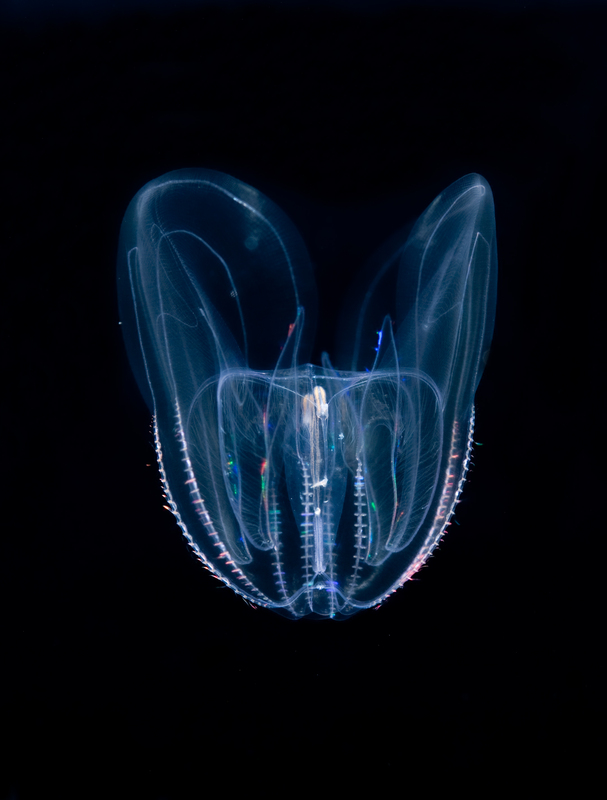 Ctenophore (Mnemiopsis leidyi) in MRC Pseudokreisel. Photo by Todd Gardner. Over the next few months, as the extremely reclusive Rainfordia pair became more comfortable in their tank, glimpses of them coming out to eat became more common and their spawns became larger. I tried a variety of foods, including frozen mysids, everything by LRS, and live shore shrimp. 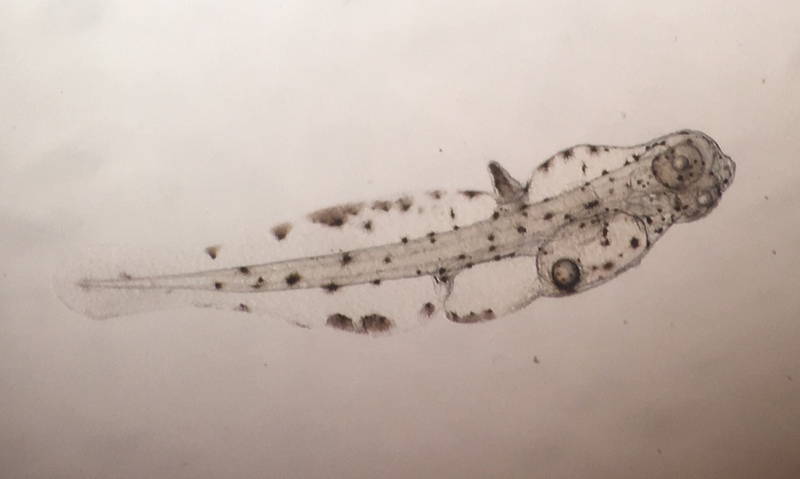 Their current feeding regime consists of one feed of LRS Fertility Frenzy, one of LRS Herring Roe, and one of live shore shrimp (Palaemontes pugio). It seems to be working well, because they regularly produce spawns of at least 1000 eggs. For the first few months of spawning, egg and early larval mortality was very high. Although I collected eggs several times each week during their spawning cycles, it was uncommon to have more than a few larvae surviving to first feeding around day 5. During this time I focused my efforts on egg handling regime. I found that disinfecting the eggs with Ovadine(TM) and hatching the eggs in sterilized salt water improved early survival and before long, I started seeing greater numbers begin feeding. 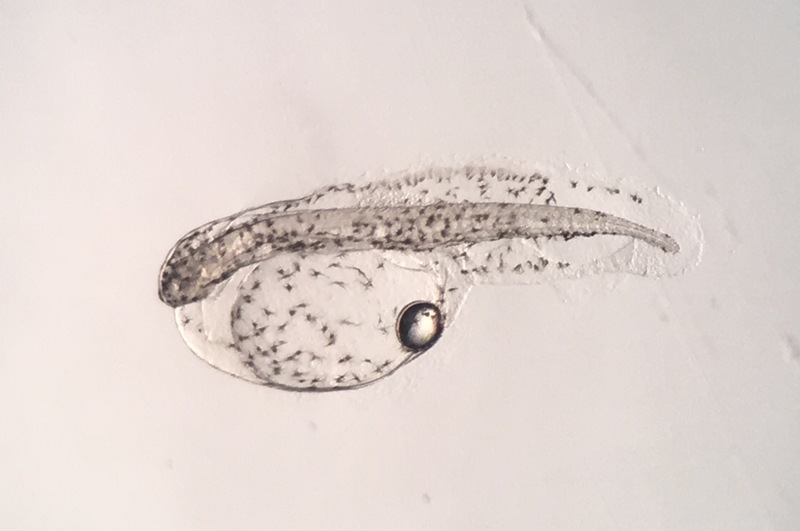 At 5 days post-hatch (dph), nauplii of the copepod Parvocalanus crassirostris from Algagen were readily accepted as a first food. During the spring semester of 2016, I was able to get several broods beyond the age of one week and in one case, two individuals as far as 17dph. I was well aware that at least one cause for my limited success was that I was not using an ideal larval rearing tank. 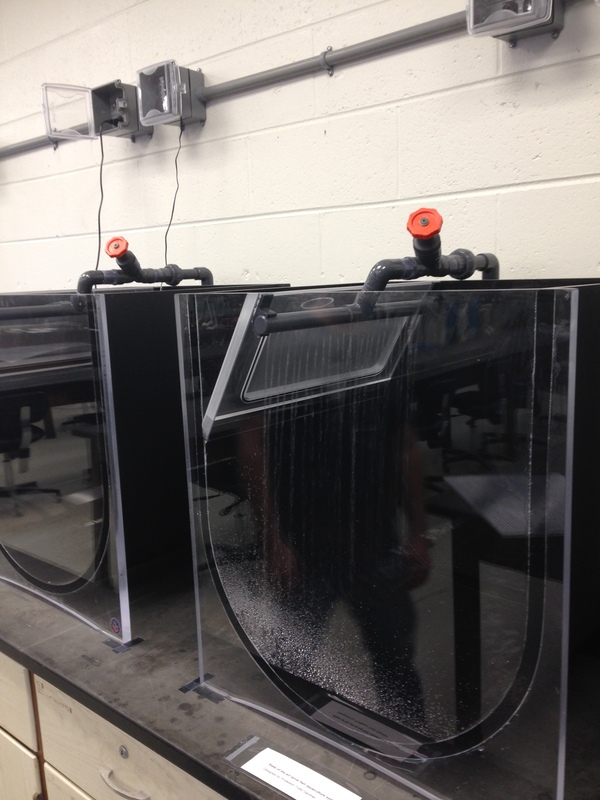 Although we had built a state-of-the-art larval system with beautiful 40-gallon pseudo-kreisels by My Reef Creations (MRC), it quickly became apparent that the shape and flow in a pseudo-kreisel does not work well for Rainfordia larvae, although, to the delight of my students, they work very well for Ctenophores. So most of my rearing attempts were taking place in a 10-gallon black polyethylene cylinder that was not attached to a system. Looking back, I find it pretty amazing that any of these larvae survived as long as 17 days in that tank. Rainfordia opercularis at 31 dph. MRC Pseudokreisels. Photo by Todd Gardner. 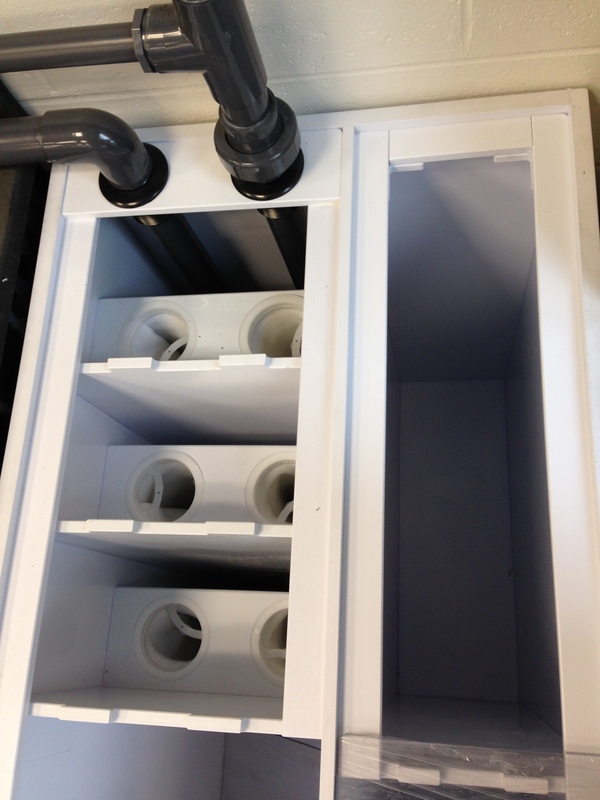 MRC sump for larval system. Photo by Todd Gardner. Near the end of the spring semester, as finals were approaching, a couple of stressful events in the classroom, coincided with a halt in spawning. I don’t know if the spawning break was directly related to the stress events, but it was unfortunate, because as classes were ending for the summer and my free time was becoming far more abundant, I suddenly had no larvae with which to work. I set the egg catcher every night, but for nearly three months there was not a single spawn. 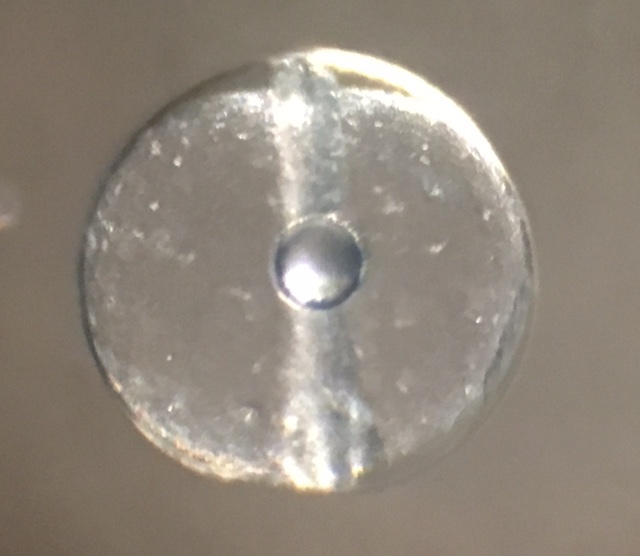 Rainfordia egg. Photo by Todd Gardner. Near the end of July, the tide turned. I came in one morning to find the flathead tank nearly overflowing. I ran for a container because I knew when that meant: something was blocking the overflow. As I suspected, that something was not a snail or a sea cucumber, but Rainfordia eggs. It was the largest spawn I had ever seen. The screen was completely covered in eggs. I didn’t have a lot of hope for this spawn for a couple of reasons. First, I had arrived late that morning, so the eggs sat on the screen, collecting detritus for about three hours longer than usual, and second, after such a long break in spawning, I expected it might take some time for the parents to get their reproductive machinery back into good shape. I placed the eggs in a 1-gallon hatching jar with moderate aeration overnight. I didn’t bother disinfecting them as there was no suitable tank available for the larvae anyway. To my utter surprise, I came in the next day to find that almost all the eggs had hatched and there was another enormous spawn on the egg collector. I had to act fast. I called all of my local aquaculture friends and alerted them to the fact that I might be calling in some favors over the next few weeks. I messaged my friends at Algagen to line up plankton shipments for the following week. I called Ashleigh and told her we needed to cancel our family plans for the coming weekend. We were taking a trip to Rhode Island. Newly hatched Rainfordia. Photo by Todd Gardner. We arrived at Roger Williams University on a Sunday morning and were treated to a tour of the most amazing aquaculture lab I have ever seen. There were so many rows of tanks, filled with thousands of Yasha gobies, clownfish, grunts, and others I can’t even recall. A full staff of employees, students, and interns was buzzing around, cleaning tanks, feeding broodstock, tending to copepod systems and algae cultures. There was a temperature-controlled room filled with larval rearing tanks, which on that day, were filled with perhaps hundreds of thousands of lookdown larvae. Andrew Rhyne had taken a run-of-the-mill marine science lab and turned it into a well-oiled machine. His efforts have made immeasurable contributions to the aquarium industry in recent years, specifically by developing aquaculture technology that is made readily available to the public, producing captive-bred fishes as well as well-trained aquaculturists, both of which are finding their way into public aquaria and hatcheries all over the world, and continuing to compile meaningful trade data that helps keep the aquarium industry sustainable while helping to protect it against regulation based on emotion-driven campaigns. On this Sunday morning, Andy’s contribution to the industry took the form of donating one of his 60-gallon conical fiberglass rearing tanks to my lab. Rainfordia day two. Photo by Todd Gardner. The following day, Paul Anderson helped me to do some minor fiberglass work on the tank before plumbing it. We decided to plumb it directly into the 120-gallon broodstock tank in order to minimize acclimation stress on the eggs and/or larvae. A small power head in the sump pushed water through two small reactors, one containing Phosban, (Donated by Julian Sprung at Two Little Fishies) and the other containing activated carbon. The effluent line from the reactors was routed to the rearing tank. I filled the rearing tank slowly, through these components, and stayed nearby as it filled so I could watch the sump level and refill it as necessary. The next morning, I arrived extra early and was rewarded with a beautiful spawn of around 1000 eggs. I rinsed them into a 1-liter container of tank water, then gently poured all but the few on the bottom of the container into the new rearing tank. Rainfordia day three. Photo by Todd Gardner. Over the next 24 hours, nearly all of the eggs hatched and I braced myself for accomplishing almost nothing other than stressing over these larvae for the foreseeable future. Knowing that Rainfordia is so closely related to Liopropoma, I knew there was a chance that they might not settle out of the plankton until November. However I had some cause for hope. I noticed in earlier trials that Rainfordia larvae only develop one filament (at least during the first 17 days) whereas Liopropoma have two. Also, at least through 17dph, Rainfordia show no signs of developing the large, buoyant sacs typical of Liopropoma larvae. The reason this gave me some comfort was because such important developmental differences might indicate differences in larval period (hopefully shorter). Of course, this was just a guess. As far as I know, the only account of Rainfordia larvae is found in a paper by Baldwin et. al, describing two wild-caught specimens of unknown age measuring 20-21mm, so the larval period remains completely unknown. At 5dph, the larvae, with their growing dorsal filaments, began feeding on Parvocalanus nauplii. 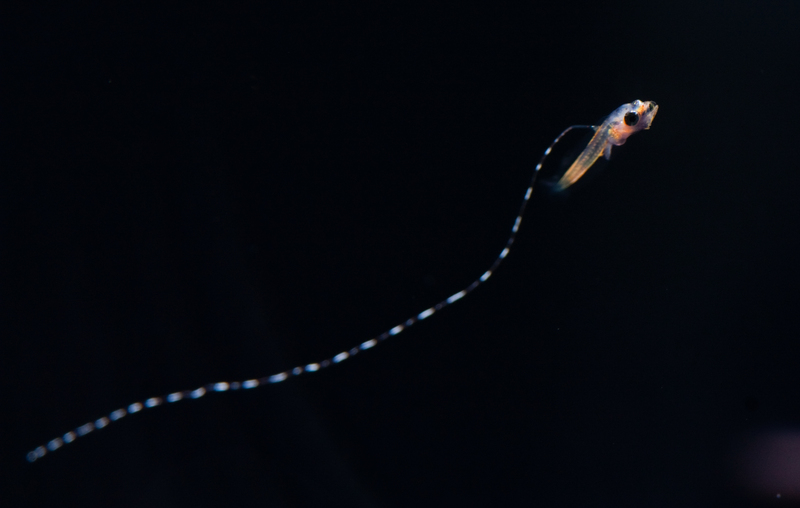 For the next few weeks, copepods and phytoplankton were provided daily. 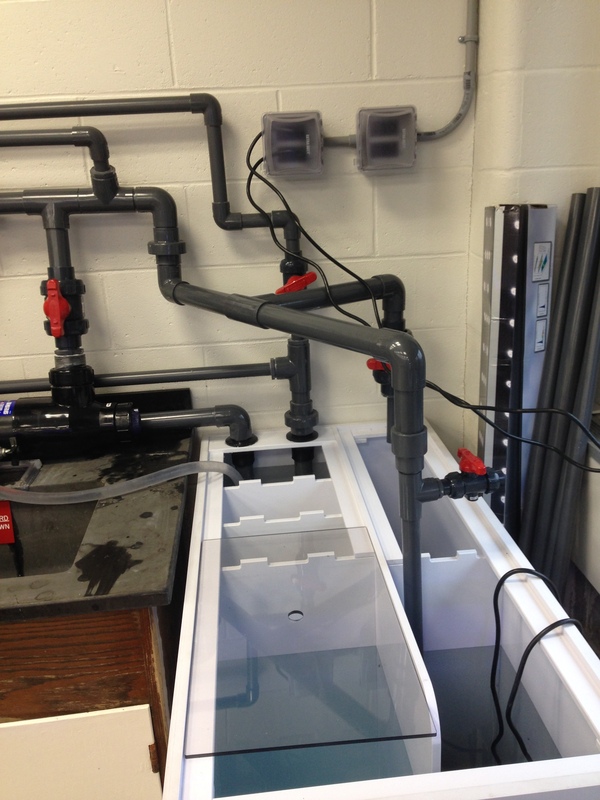 The copepods and algae were provided by Algagen and supplemented with occasional contributions from the Stony Brook Marine Science Lab in Southampton and the Long Island Aquarium (Thanks to Noel Heinsohn, Katie Marino, Chris Paparo, and Andrew Lundstrom for that). For the first five days, there was no water exchange in the rearing tank. On day six, I started a very slow flow through the system as described above. The effluent standpipe was covered with 40-micron mesh for the first week, after which it was replaced with a 100- micron mesh, and after three weeks, a 500-micron mesh. The larger mesh size allowed much of the live food to be flushed out, but was necessary in order to increase the rate of flow to the tank without risking an overflow. As the weeks progressed, the copepods Acartia and Pseudodiaptomus (also from Algagen) were added to the diet. Rainfordia 14dph. Photo by Todd Gardner. There was steady mortality apparent every day for the first 16 days. At day 17, a large spike in mortality indicated a possible developmental milestone. Microscopic examination confirmed that the larvae were beginning flexion – the development of the caudal fin from posterior vertebral elements. This is typically a very stressful period in the life of a fish larva. Rainfordia 35dph. Photo by Todd Gardner.